Our annual walk to end diabetes on Saturday, September 30, brings together more than 3,500 walkers on the lakeshore in Chicago and in the area around Buffalo Grove. 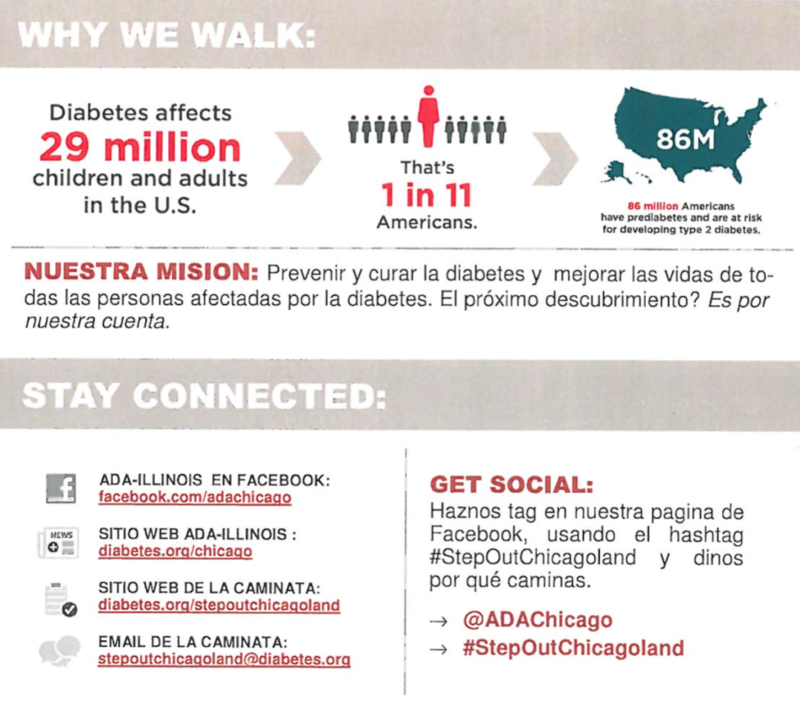 Every mile that you walk and every dollar that you raise, contribute to the vision of the American Diabetes Association: a life from diabetes and all of its difficulties. 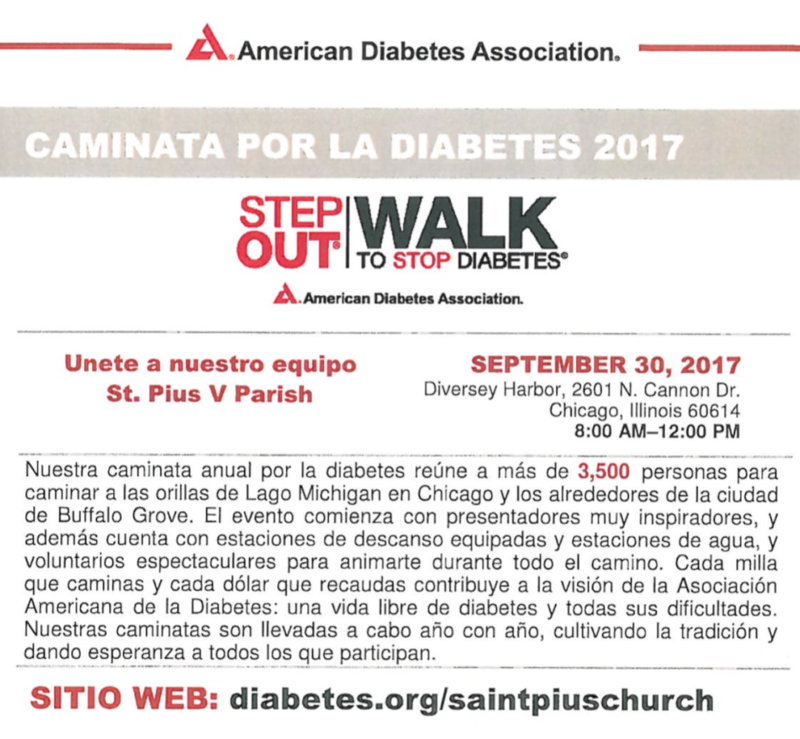 To take part in the walk or support the team from St. Pius V, please visit this website: diabetes.org/saintpiuschurch. Take Part in Our New Parish Banquet on October 21! This fall our parish family launches Un Nuevo Amanecer / A New Beginning – an annual parish banquet to support and enliven our mission to evangelize, educate, and empower our community in transition. Un Nuevo Amanecer banquet will take place on October 21, 2017 beginning at 6:00 pm. Food, music, a silent auction, and other features will be a part of the evening. You are invited to participate in this banquet with your presence! Reservations are available for a donation of $50. You can also support the parish by becoming a sponsor of the banquet or placing an ad in the program book for the event. Sponsorships: Sponsors have a major impact on the success of the parish banquet and receive recognition and reservations at the event. For more information on sponsorships click here. Ads in the program book: You have an opportunity to promote your business, honor someone, or remember a loved one who passed away by placing an ad in the event program book. Proceeds from the ads support our parish mission. For more information on the ad book click here. 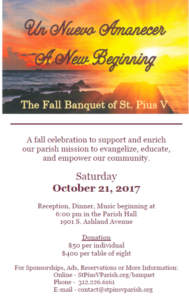 All of us as a community of faith can make this banquet a great success and support for St. Pius V parish! For questions or more information, please call our parish office at 312-226-6161.